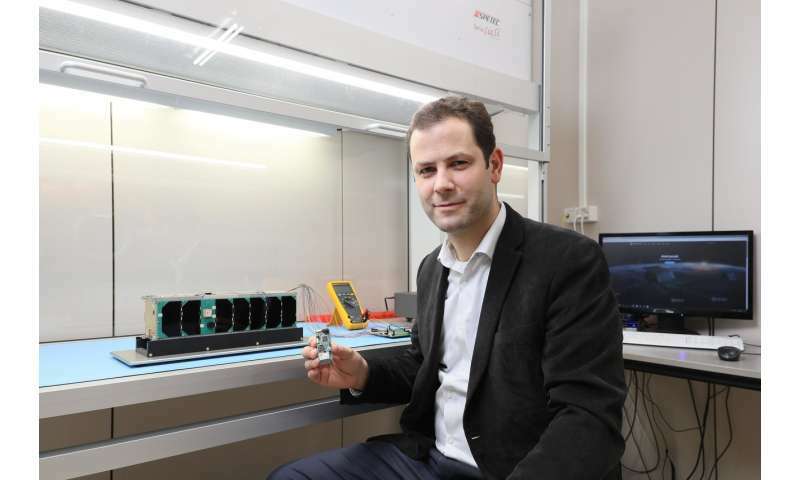 Yesterday evening, Astrocast – a young start-up spun out of EPFL – launched its first demonstration satellite intended to test its Internet-of-Things system. It was put into orbit by a SpaceX rocket that took off from California. This Monday December 3rd was a big day for Astrocast. At 7:34pm Swiss time, the first satellite produced by this EPFL start-up took off from California on board a SpaceX Falcon 9 rocket. The launch, from Vandenberg Air Force Base in Santa Barbara County, went smoothly. The rocket was carrying almost 70 satellites, which were gradually put into a sun-synchronous polar orbit at an altitude of 575km in the hours following take-off. Astrocast's satellite is in the CubeSats category, which is a type of nanosatellite defined by a standard cubic shape measuring 10cm on each side. It consists of three units and is approximately the size of a shoebox. This satellite is for demonstration purposes, and a second one of the same type will be launched from India in January. They represent the first in a long line of Astrocast satellites: they will be used to test the system that Astrocast plans to market, which will involve a further 80 satellites in orbit by 2022. This Internet-of-Things (IoT) system will connect millions of objects all over the Earth's surface. It will enable Astrocast clients to monitor infrastructure and facilities remotely and at a much lower cost than existing methods. For example, it will allow a company developing water purification machines, intended particularly for remote African villages, to maintain them much more efficiently. The machines will have a communication module inside them that will send water consumption and status data several times per day. To set up the system, two sets of ten satellites are scheduled for launch in October 2019 and early 2020. They will make up the first part of Astrocast's constellation, which will cover the Earth's entire surface. Using the satellites in these two orbital planes, the company will sell an initial communication service to a number of interested clients. Astrocast employs around 40 people and was founded in September 2014 under its previous name, ELSE. In addition to its main office at EPFL Innovation Park, the company also has a branch on the US west coast. Astrocast was set up by Fabien Jordan, the company's CEO, who also worked as an engineer on Switzerland's first satellite, SwissCube. That satellite –developed at the Swiss Space Center and launched in 2009 – is still in use today.